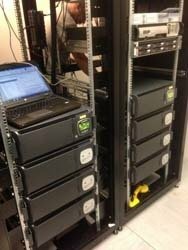 More and more clients at EcoPowerSupplies are turning to rack mount UPS systems for their comms rooms and data centre cabinets. Installing a UPS within a rack cabinet can help to reduce overall costs, tidy cable runs and optimise floor space. It’s relatively easy to get the installation right if you follow these simple guidelines. The first thing to consider is UPS sizing and to carry out a load analysis and audit. Your rack cabinet will probably house a mix of loads including servers, routers, bridges and other necessary network peripherals. You may also have more then one server rack cabinet. Start with a blank spreadsheet and list the cabinets as Rack 1, Rack 2, Rack 3 and so on. Then list the equipment within each rack cabinet and if possible put them onto the spreadsheet in the order in which they appear within their racks. Then it’s a question of calculating or measuring the actual current (Amps) drawn by each piece of hardware. This can normally be done as part of a Site Survey by EcoPowerSupplies using one of our hand-held iMeter systems. If you cannot measure the load an internet review for datasheet information can be useful. Alternatively, you can simply go off the rear panel power supply rating plates but this will generally lead to an over-sizing. Take care when doing actual load measurements where dual-corded power supplies are used in case these load-share or operate in an N+1 redundant capacity. Where you can, measure both the running and actual start-up currents. If you only have Watt ratings list these in a separate column. One you have an estimate of the Amps drawn by each piece of kit and rack cabinet, multiply this by 230Vac (if UK-based) to get a total VA figure. For Watt ratings take a rule-of-thumb and divide these by 0.7 to get a VA rating. Then add up all the VA values to give a total rating. Divide this by 1000 to get a kVA figure if you need one. This total kVA figure shows the total UPS size required. It is also important to look at this at an individual rack cabinet level for reach rack as it may be necessary to put one UPS per rack rather than a single UPS installation powering all racks. Once you know the UPS size(s) you require, then consider what back-up time required. It may be that you only want a few minutes in order to ride through momentary power cuts or want to ensure you can work for several hours. It’s important to make sure (whatever your battery runtime requirements), that your battery trays will fit into the rack. If not, you may need to consider a separate floor standing battery cabinet. Once you have your UPS and battery cabinets sized you need to consider the capabilities of your server cabinet. Most cabinets will take up to 150-300Kg in weight. The larger the installation, the more important it is to check if your server cabinet is a light or heavy duty type. To mount the UPS system in the cabinet, slides (runners) or shelving will be used which will secure onto the vertical structs. The UPS system will then either use clip-on slides so it can be pushed into position or be placed on the shelves. This could well require a two-man team due to the weight of the UPS and its associated battery trays. It’s also important to consider the depth and height of the cabinet. Most cabinets are 600mm, 700mm or 800mm deep so it’s important to make sure the UPS sits inside the depth of your cabinet and won’t overhang. Also you need to ensure there is sufficient space (U) available to accommodate the UPS system. Once you have analysed your load and server cabinet arrangements, it’s then necessary to consider how the entire installation is to be powered. The drawing shows a typical arrangement with a 10kVA UPS installed with a single battery cabinet in Rack 1. The UPS is always near the base of the rack for ease of access and so as not to ‘upset’ the centre-of-gravity. It is also best practice to place the UPS above the battery to ensure the battery is in the coolest part of the rack. The PDU cable runs. Most PDUs have a 2m cable run and so its important to order PDUs with sufficiently long cable runs to reach the HPDU if using multiple server cabinets. Outlets: review the PDU outlet (socket) and plug configurations. Most PDUs will have a C13 (female) or BS UK style output socket. At EcoPowerSupplies our PDUs can be supplied with 8, 10 ,12, 16, 20 and 24 outlet sockets. Extra IEC-to-IEC cables can be supplied if required to run power from the PDU outlet to the IT load system(s) themsevles. Plugs: the PDU will require a plug type to match the socket on the HPDU. In this example the PDUs have C20 (male) to match the C19 (female) on the HPDU. For more information see our plugs and sockets guide. What’s important is not to over-load the sockets on the HPDU and PDUs themselves. These will include their own level of protection which may be thermal trips and fuses (breakers being a more costly option). A C13/C14 arrangement will only provide a maximum of 10A (2.3kVA) and a C19/C20 16A (3.6KVA). This is why it is important to map out the load, PDU, HPDU and UPS connections to ensure an optimised load and power configuration. If you have a raised computer room floor it is important to check the pedestal/tile floor loading as the UPS system increases in weight. Individual battery packs may only be 30-50Kg in weight but combined that can give 200Kg with the UPS over a two floor tile area within a server cabinet. Alternatively a free-standing battery cabinet could have a 500-1000Kg or more weight within a 1m square. Floor loadings are measure in (Kilo-Newtons) kNs and a structural engineer can normally provide assistance with any calculations here. Floor loadings can be eased through the use of a spreader plate or extra pedestals secured mid-floor-tile. The height of the raised floor can also be an issue here as can any overall weight restrictions for the building area itself. Always remember that once your comms room or datacentre door is closed, the UPS are in isolation. A UPS system can provide a rich array of operating information including loadings, battery charge and load % and it’s important to monitor these and any associated operational alarms. SNMP can be used to monitor the UPS over a network IP address and is always recommended. The facility is provided by an interface card that can plug directly into the rear communications slot of a UPS system. Where SNMP is not an option a remote desktop monitoring system can be provided or the UPS can be connected to a Building Management System (BMS) panel. A rack mount UPS installation can look relatively simple but there are several things to consider to get it right. At EcoPowerSupplies we are always available to provide advice and assistance.